사천왕은 갑옷을 입고 위엄이 충만한 무인상을 하고 동·서·남·북의 사천국(四天國)을 다스리는데, 우리나라에서는 통일신라 초기부터 나타나기 시작하여 조선시대에는 사찰입구에 사천왕문을 세워 모시고 있다. 대웅전을 향하여 오른쪽에는 동방 지국천왕(持國天王)과 북방 다문천왕(多聞天王)이, 왼쪽에는 남방 증장천왕(增長天王)과 서방 광목천왕(廣目天王)이 위치하고 있다. 동방 지국천왕은 호화롭게 장식된 보관을 쓰고 얼굴은 분노한 표정을 하였으며, 복장은 갑옷과 천의(天衣)를 입고 있다. 건장한 체구에 오른손으로 칼자루를 잡고 왼손은 칼끝을 받쳐들고 있다. 북방 다문천왕은 높직한 보관을 쓰고 미소를 띤 인자한 모습으로 선비형의 눈썹과 긴 턱수염에서 부드러운 문인의 모습을 떠올리게 한다. 비파를 들고 있으며, 발 아래에는 힘에 겨운 듯 고통스러워 하는 악귀가 왼쪽다리를 받쳐들고 있다. 남방 증장천왕은 굳게 다문 입과 함께 근엄한 얼굴 표정을 하고 있고, 오른손에 칼을 들고 있고 있으며, 왼손은 무엇인가 쥐고있는 듯한 자세만을 취하고 있다. 당당해 보이는 신체는 수호신으로서의 모습을 잘 표현하고 있다. 서방 광목천왕은 부릅뜬 눈에 입을 벌리고 소리지르는 듯한 위엄있는 모습이다. 오른손에는 깃발을 잡고 왼손에는 무엇인가 들고 있었던 모습인데 보탑이었을 것으로 추정된다. 조선시대 사천왕상 대부분이 중국식 갑옷에 각기 다른 상징물을 들고 있으며 발 밑에는 악귀를 밟는 형태상의 특징을 갖는다. 또한 무장한 분노상에 화려한 보관을 쓰고 천의자락을 휘날리며 보관 밑으로 흘러내린 머리카락이 귓바퀴를 돌아 어깨 위에서 여러 갈래로 갈라지는 자비로운 보살상의 모습이 추가되고 있다. 보림사의 사천왕상은 이러한 특성을 가장 앞서 선도하고 있다는 점에서 불교조각사적 비중이 매우 크다고 할 수 있다. 이들의 조성시기는 천왕문에 걸린 목판과 『보림사중창불사기록』에 의하여 중종 10년(1515)에 조성되고 이후 2차례에 걸쳐 중수되었음을 알 수 있다. 따라서 보림사 사천왕상은 현존하는 천왕문 목조사천왕상 가운데 가장 오래된 것으로 임진왜란 이전의 것으로는 유일한 것이라 할 수 있으며, 각 부의 조각이 매우 우수할 뿐만 아니라 조선시대 사천왕상의 기본이 되는 귀중한 유물로 평가된다. 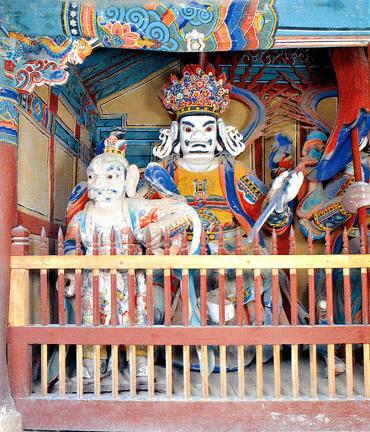 The statues of the Four Guardian Kings in the shape of warriors in armor first appeared in the early Unified Silla Period (676 – 935) as those ruling over the four directions. 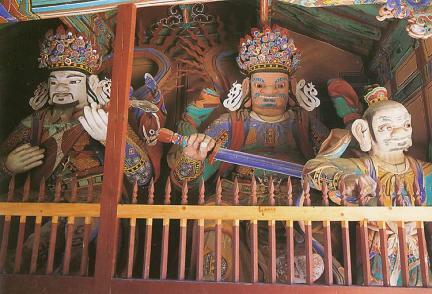 In the Korean Peninsula, the Gate of the Four Guardian Kings came to be built at the entrance of temples during the Joseon Period (1392-1910). Dhattrattha (ruling over the east) and Vaisravana (north) are on the right, with Virudhak (south) and Virupaksa (west) on the left. Dhattrattha wears a gorgeously adorned jeweled crown. He wears a heavenly robe beneath the armor, his face showing anger. He has a robust physique, with the right hand holding the sword handle and the left hand holding up the sword tip. Vaisravana wears a high jeweled crown and a benevolent simile, reminding one of the gentle image of a scholar. 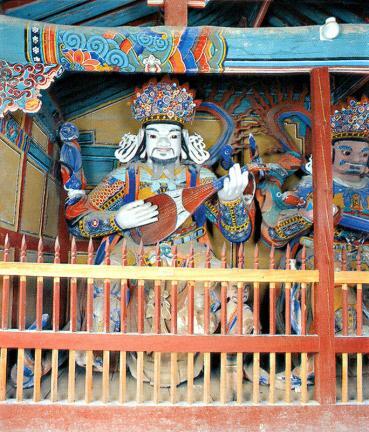 He also holds a lute. 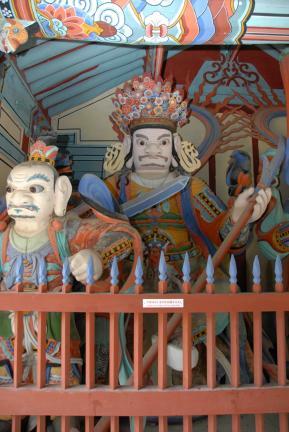 A devil kneeling down holds up his left foot, his facial expression showing that it feels painful under the king’s weight. 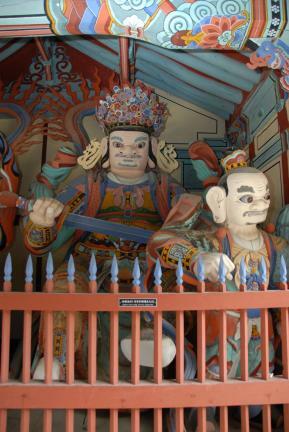 Virudhak has a tightly closed mouth and a stern facial expression, holding a knife in the right hand. Overall, he displays an imposing figure of a guardian. 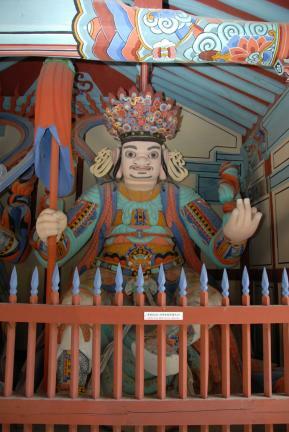 Virupaksa has glaring eyes, looking as if he is yelling at someone. He holds a flag on the right hand. 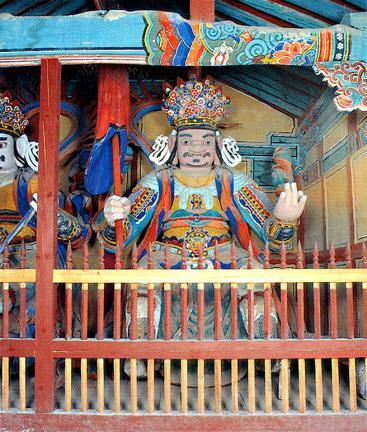 The statues of Four Guardian Kings made during the Joseon Period (1392-1910) are in Chinese-style armor, each holding symbolical objects different from each other in the hands. 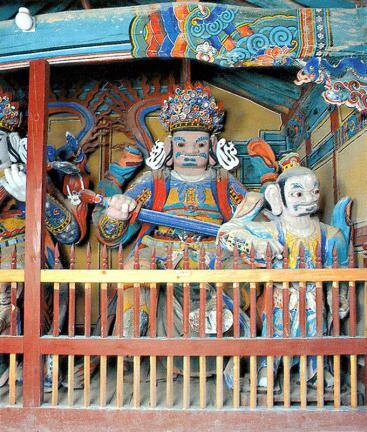 They have diverse appearances, wearing facial expressions ranging from anger to benevolence and heavenly robe or armor. The images kept at Borimsa Temple are superior to those kept at the other temples, thereby occupying an important position in the history of Buddhist sculptures. 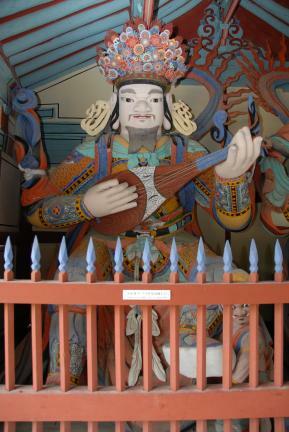 The wooden tablet hung nearby and the relevant records say that the statues were made in 1515 (the 10th year of King Jungjong’s reign) and repaired on two occasions. 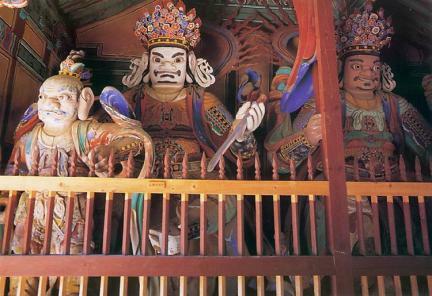 They are the oldest ones of their kind in the country and the only ones made before the Japanese Invasion of Korea in 1592, displaying the exquisite skills of craftsmen.